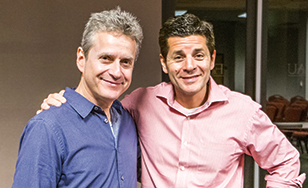 Comedians Scott Blakeman and Dean Obeidallah will visit St. Scholastica to talk about conflict resolution and social ethics, especially among Jews, Muslims and Arabs. "Standup for Peace" will be at 7:30 p.m. Tuesday, March 26, in the Mitchell Auditorium on campus. Focusing especially on differences of background and religion - Jewish-American Blakeman and Muslim-American Obeidallah, the son of a Palestinian father - the two comedians use humor and honesty to encourage social tolerance and rebuild bridges between dissonant peoples. Their mantra is, "if we can laugh together, we can live together." The theme of the 2018-19 Alworth Center for the Study of Peace and Justice lecture series is "Unraveling the Israeli-Palestinian Conflict," focusing on the current state of the Middle East and America's involvement in the region. The final event of the season will be: "Celebrating the Culture of Palestine," featuring sibling entrepreneurs/philanthropists Hussein and Aminah Musa, 7:30 p.m. Tuesday, April 9 in the Mitchell Auditorium.